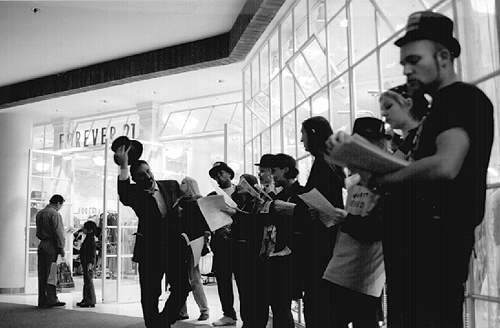 On Saturday the 22nd, the Billionaires for Bush/Gore/Greater Corporate Profits sang some "carols" at Forever 21 in the Glendale Galleria. Photo by Mike Snow. A motley contingent of activists from the IMC, Arts In Action, ISO, went down to the Glendale Galleria to sing Christmas carols. To support the GWC, they seranaded Fashion 21, which is being sued by nineteen sweatshop workers who say they're owed back pay by Forever 21.